A path constructed of brick or clay pavers gently meandering through the garden can be an attractive feature. If feeling a little more ambitious, why not try laying some pavers around the barbecue? They'll give the area a lovely natural feeling, perfect for when a few friends drop in. There's quite a range of pavers from square, hexagonal and interlocking designs, so have a good look before starting. Manufacturers of pavers are an excellent source of information and their brochures also show the many patterns used when laying pavers. Just remember, if paving near the house, allow a gentle fall-away for the water to escape. With the right tools and materials, paving can be a fairly simple job. For preparing the ground, a shovel, rake, stringline, stringline level or carpenter's spirit level and tape measure are needed. If it's a big area to be tackled, consider hiring a bobcat for the excavation work. 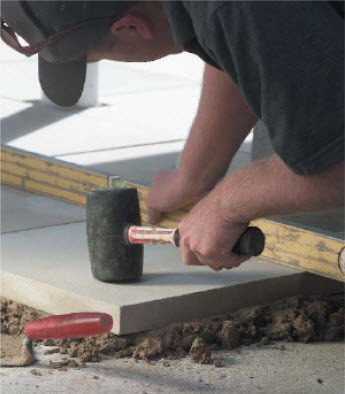 For laying the pavers, a mash hammer and rubber mallet, together with a piece of timber are required. Cutting equipment will also be necessary, such as a brick bolster/paver splitter and masonry saw. A trowel is also handy. To finish the job off, consider a vibrating compactor, which can be hired. A hair broom, pavers, crushed rock and river sand are also needed. Use rock 75mm thick for areas such as patios and courtyards, but make it 100mm thick if cars will be driving over it. 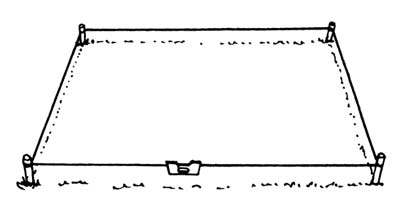 Allow one cubic metre for each 40 square metres at 25mm and one cubic metre for each 20 square metres at 50mm thick. A flat piece of timber is needed as a screed board. Cement mix, some timber stakes and long lengths of timber to use as formwork (at least 75 x 22mm lengths) are also required. Think the project through. Accurate planning is the key to success. 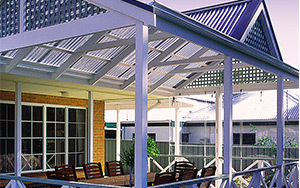 Knowing the exact size will assist in purchasing the exact amount of materials. Nothing should be wasted. Think about drainage to ensure water does not remain on the area after heavy rain. Some agicultural pipes now can overcome some agony later! The amount of traffic the paving has to handle will dictate the choice of pavers. 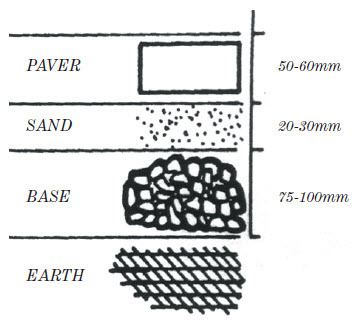 Pavers of 50mm are suitable for paths and patios but 65mm pavers are needed for driveways. 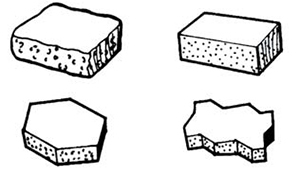 Pavers come in a variety of shapes and sizes: square, rectangular, hexagonal and interlocking. There is a choice of colour, too. Take some time and choose well. Stake out the perimeters of the site. Run string from stake to stake at the levels required for the finished job. Check that the levels are right. Don't forget to allow for a slight run-off slope away from your house or other buildings. It is now ready for excavation. Remove the grass and topsoil down far enough to accommodate the recommended levels of crushed rock, sand and pavers (Diagrams 3 and 3a). Preparation is paramount. The surface must be level with no soft spots. Fill any soft spots with rubble or crushed rock and compact thoroughly. Hire a mechanical compactor if necessary. The next step is the formwork. Position the boards around the boundary and drive the stakes in behind each board at one-metre intervals. 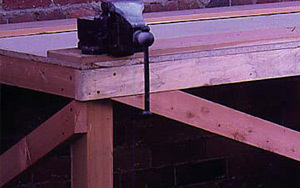 Consider drilling holes in the formwork and fastening the boards to the stakes with wire. Make sure the tops of the boards are level. Spread the crushed rock over the prepared surface - at least 75mm for paths and patios. 100mm for driveways. Compact it thoroughly. Spread an even 30mm layer of damp sand over the crushed rock. Make certain medium river sand or sharp sand is used. 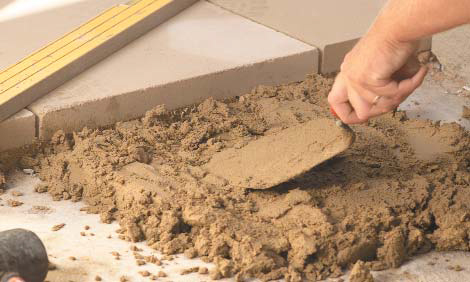 With the help of a screed board, smooth the sand to a uniform level (Diagram 4). 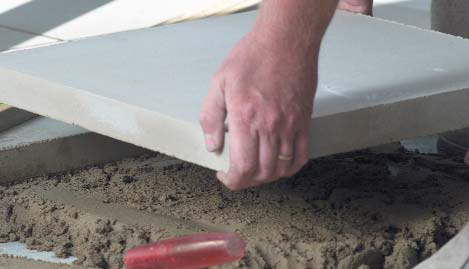 Make a screed board by cutting a notch at each end of a length of timber wider than the area being paved. Cut the notches to give a sand level 10mm less than the height of the paver to allow for later compacting. Screeding is a simple operation, but help may be needed on wide areas. Screed and pave in stages of, say, two or three metres at a time. It's easier that way. Start paver pattern from outside the sanded area. Always begin at a corner. If the job is on a slope, start on the down side and work up. Place the pavers on the sand and allow a 2-4mm gap between each one. Gapping provides room for the jointing material at the final stage. Use a trowel to position the gap. Every square metre or so, tamp the pavers level with a rubber mallet and a piece of timber. Work steadily in a circle moving the timber like the hands of a clock and check the result with a spirit level. Large areas may call for the use of a mechanical compactor with a piece of old carpet fitted to the plate to protect the surface. 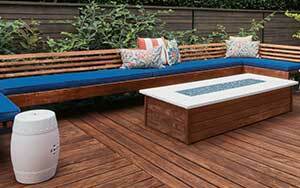 If there is a need to walk or stand on newly laid paving, use a plank or a piece of plywood to spread the body weight. Pavers for edges or corners may need to be cut. If so, make a groove on each side of the paver with a mash hammer and bolster and finish the cut with a sharp blow. Hire a paver splitter or a brick saw for big jobs. If the project can’t be completed in one day, it’s wise to tramp one metre of the edge in case overnight rain disturbs the fill. When all the pavers are in position and level, spread with fine sand and fill the gaps by sweeping gently with a hair broom. Use a dry mix of 6 parts fine sand and one part cement for steep grades. When totally satisfied all the gaps are filled and the surface is level, brush away the excess fill and use a fine spray to gently wet the surface. The idea is to wet the surface, not wash it away! To prevent the paving from spreading or sinking, some form of permanent border is recommended. If the formwork is treated timber or hardwood, leave it in place. The formwork can be replaced with upright pavers to make a decorative edge. Another trick is to lay a concealed concrete edge in a trench below the surface level, cover it with soil and sow grass to the edge of the pavers. Remember not to rush. Do it right, step by step and the paving will last a long time. Have paver and sand suppliers deliver to a spot as close as possible to the work area. Never use beach sand – it contains salt which can stain the pavers.